It's a real shame that an album like this "Supreme Commanders of Darkness" has come so late in 2015 and has had very little promotion, but to be honest I was completely unaware of this band Totten Korps from the southern hemisphere, natives from Chile, it turns out that they are one of the pioneering bands of death metal beginning their career in 1989, in that year they recorded their first demo and so they continued recording two more demos until 1991, during 1992 they recorded their first EP, entitled "Our Almighty Lords" for Toxic Records and after that it took them nearly a decade to release their album debut entitled "Tharnheim: Athi-Land-Nhi; Ciclopean Crypts of Citadels" this occasion to Repulse Records, since then they had not recorded any new material. 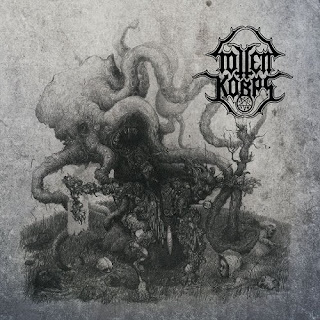 After twenty-six years it is normal that Totten Korps has undergone several lineup changes, but always aiming to deliver a brutal and oppressive death metal as only they are able to bring it, the current band members are Francisco Torres and Cristian Soto on guitars, Sadax on vocals, Alejandro Arce on drums and Al Azif on bass. "Supreme Commanders of Darkness" contains ten tracks full of ravishing savagery, vicious riff takes over since the first moment, the first track is the self titled album, the intensity released here can be compare only with main acts such Nile, Cannibal Corpse, Cryptopsy or Suffocation followed by "The Black Flame of the Underworld" limitless brutality, discharges layers of chaos and darkness inside your mind, next is "El Antiguo Maestro de las Pestilencias" is aggressive and dynamic, keep the balance to receive "Hastur’s Voice Echoes in Our Minds" a cut very fast, violent with blistering drums the vocals are malevolent, "The Journey through Styx on the Arms of Hades" and "The Legacy of Leviathan (Shadows from the Depths)" blends evil with darker ambience to set the proper passage to the underworld, "Nailing" is the antechamber to hell that everyone expect from an album of this magnitude completely possessed by demons, the closing track is "Tortured Souls from the Paths of Perdition" drenched in slow riff and merciless drums we witness some of the most doomstastic and brutal vocals which differ from the rest of the album, excellent way to put an end. 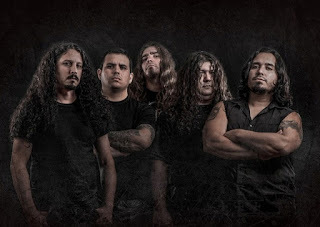 This album is rooted in the old school death metal with frantic outbursts and as I stated in the beginning of this review, it is a real shame this album was released at the end of 2015, without any doubt this is a remarkable album, I hope everybody who is looking for real underground, take this review seriously because these Chileans deserve to be heard.